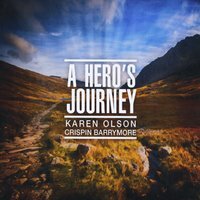 A Hero’s Journey is the collaborative recording of violist Karen Olson and pianist / multi-instrumentalist Crispin Barrymore. Promising a “voyage into a sonic landscape that merges contemporary classical influences with ambient textures, rhythmic elements, and new age melodicism”, its description not only fits to a tee, but the sheer beauty and emotional depth of this album proved to be far more than I ever could have expected. “Horizon’s Calling” begins with a swelling mist of chords that soon introduce a gentle viola melody, immediately creating a warm and enveloping soundscape which conveys both a subtle melancholy and sacred introspection. Setting the mood for the rest of the journey, an illuminated ambience that’s often characterized by seemingly processed environmental sounds permeates the album, while highlighting minimal classical motifs throughout as expressed via Karen’s beautiful viola playing. On the second track, “Life’s Persuasions”, her lovely instrument weaves in and out of swirling metallic timbres, which are gently guided along by a lightly tapping electronic rhythm. The fourth track, “Still Crying”, is a most hauntingly gorgeous piece and quite easily my favorite on the album, in which Karen’s viola shimmers and vibrates among glistening electronic textures and a slow breakbeat-type rhythm. By the sixth track, “Facing Fear”, the perceptual notion of this album being about an inner personal journey of sorts really comes to fruition. Here, the viola is more at the forefront of the composition’s somewhat stark and foreboding yet inherently minimal soundscape. Lending a subtle contrast in mood is the seventh track, “Going Beyond”, which conveys a gently comforting and radiant aura with its sparkling piano and soothing viola. The eighth track, “Life Force”, is another favorite of mine, in which an emotive viola melody intertwines with environmentally lush layers and a liquid chill rhythm. Concluding the album is “Epilogue”, which paces along in a procession-like manner, lending cinematic touches to the ensemble of viola, organ and synths, as well as the occasional brush of symphonic drums.